Astronomer Fred Bruenjes took this image documenting the 2004 Perseid meteor shower with 30 second exposures over the course of six hours with a wide angle lens. The image combines the trails of 51 meteors that streaked across the sky. Look up Friday and Saturday nights (Aug. 11 and 12) for this year's Perseid meteor shower peak. Moonrise on Aug. 11 comes at around 10:20 p.m. local time, while on Aug. 12, it's at around 10:50 p.m. The moon will be hovering below and to the left of the Great Square of Pegasus these nights and not all that far from the constellation Perseus, from where the meteors will appear to emanate (hence the name "Perseid"). Perseus does not begin to climb high up into the northeast sky until around midnight; by dawn, it's nearly overhead. But bright moonlight will flood the sky through most of those two key nights and will certainly play havoc with any serious attempts to observe these meteors. So, unfortunately, the moon intervenes to spoil the Perseid's best, even if your part of the country is blessed with clear skies. You do have options to watch the 2017 Perseids online. On Saturday, the online Slooh community observatory will host a free webcast of the Perseids here, beginning at 8 p.m. EDT (0000 GMT). The webcast will also appear on Space.com, courtesy of Slooh. The Virtual Telescope Project based in Italy will host a live webcast Saturday at 4:50 p.m. EDT (2050 GMT). You can watch that Perseids webcast live here at start time. The Perseids are already around, having been active, although weak and scattered, since around July 17. But a noticeable upswing in Perseid activity has taken place during the last few nights, leading up to the meteors' impending peak. They are typically fast and bright, and they occasionally leave persistent trains. Every once in a while, a Perseid fireball will blaze forth, bright enough to be quite spectacular and more than capable of attracting attention even in bright moonlight. Even more unfortunate than its brightness, the moon is full on Aug. 7, so it will always be above the horizon during the predawn morning hours (when Perseid viewing is at its best) in the few days before the peak. So moonlight will even spoil the gradual increase in the shower's meteor rates. The moon arrives at last quarter on Aug. 14, and thereafter, its light becomes much less objectionable. But by that time the peak of the display will have long since passed, leaving only a few lingering Perseid stragglers in its wake. The Perseid meteor shower peaks before dawn on Saturday, August 12. It is always the most reliable in the year, but this year the waning gibbous moon will hamper viewing efforts. We know today that these meteors are the leftover debris shed by Comet Swift-Tuttle along its orbit. Discovered back in 1862, this comet takes approximately 130 years to circle the sun. And in much the same way that the Tempel-Tuttle comet leaves a trail of debris along its orbit to produce the spectacular Leonid meteors of November, Swift-Tuttle produces a debris trail along its orbit, causing the Perseids. Most years, in the absence of bright moonlight, a single observer watching from a clear and very dark location might see up to 90 meteors per hour on the peak night. This year, however, observers will see closer to 40-50. But in 2018, the peak night will coincide with a new moon, making for a much different story. The skies will indeed be dark and meteors likely plentiful. As they used to say in Brooklyn, when the Dodgers played at old Ebbets Field, "Just wait 'til next year!" After the Perseids have gone, there is one last summer meteor shower left: the Kappa Cygnids (followed by the Orionids in the last half of October). The viewing period for this minor shower are rather short — Aug. 19-22 — with the peak on the 21st. Though the maximum rate is only four per hour, this stream does provide an occasional flaring fireball, and a careful observer may be nicely rewarded for the time spent. Sometimes, just a single spectacular object can make an entire night of watching worthwhile. The viewing circumstances for the 2017 Kappa Cygnids are the best possible, since their peak this year coincides with a new moon — the same new moon that will eclipse the sun on that very same day. The constellation Cygnus, from which these meteors appear to radiate, is also popularly known as the Northern Cross. This cross will lie directly overhead at around midnight and will stand upright on the northwest horizon when dawn is breaking about 5 hours later. 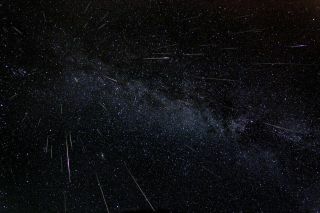 Editor's note: If you snap an awesome photo of Perseid meteors that you'd like to share with Space.com and our news partners for a potential story or gallery, send images and comments in to spacephotos@space.com.